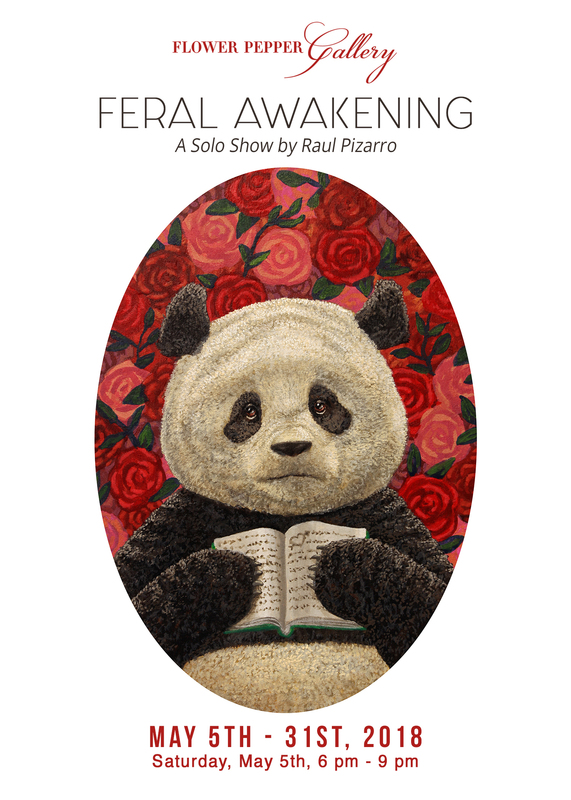 On Saturday, May 5th, Flower Pepper Gallery is pleased to present, Feral Awakening, a solo show by Raul Pizarro. Raul’s story is as unique as it is inspiring. Living with a rare form of muscular dystrophy, he is forced to constantly shift and reinvent his painting technique at the various stages of muscle loss. Even with these challenges, his incredibly detailed style shines through. While each painting carries the weight of what he must overcome, it is his inspirational outlook and message of self-reflection and discovery that stirs the spirit and leaves viewers feeling challenged and uplifted. “I grew up very introverted especially in public spaces. My body was visibly different due to the neuromuscular disease that made me very thin and caused me to walk strangely. Odd stares, whispering and being ‘othered’, made connecting with others very challenging as a child. For the longest time I didn’t realize my brain was wired from flawed ideas from those early years in my life. These paintings are about those moments where many of those faulted truths started to crumble and the awakening that ensued. This stunning exhibition features realistically painted panda bears acting in whimsically human ways. Each piece is housed in a gilded, hand-sculpted frame that was also created by the artist. With such great attention to detail, each painting feels precious and each charming character seems just as capable of stealing our hearts as the other. His “Love Is” series is irresistible for many reasons. Each depicts an adorable panda portrait in front of a brightly colored background but to our surprise, and seemingly to these pandas’ as well, they each have a different, much smaller animal seated comfortably on their heads. For example, in “Love is Contemplation,” Raul has painted a giant panda that seems to be deep in thought and considering his situation of having a turtle on his head. Both appear calm and it is surely an amusing image, but one that does effectively invite us to contemplate. These different interpretations of what “love is,” take such a simple form but they are very effective in getting us to look a little deeper into the meaning of love. In “Little Temple”, a panda is walking through a forest like a graceful Grecian nymph. Behind the branches is a luminous backdrop of stars that radiate light in a way that is both illustrative and magical. In this painting the branches seem to grow into the shape of an arch like we might see in a church, but what is striking is that we don’t know if “Little Temple” refers to the forest, or the panda bear itself. Similarly, in “An Open Heart”, we see the comparison made between an open heart and an open book. We see a panda is seated in front of a romantic background of roses, holding an open book outward for all to see. It is a position of vulnerability and one that feels all too familiar, but this piece’s poignant simplicity is what makes it so relatable and honest. It is this combination where Raul Pizarro truly excels.